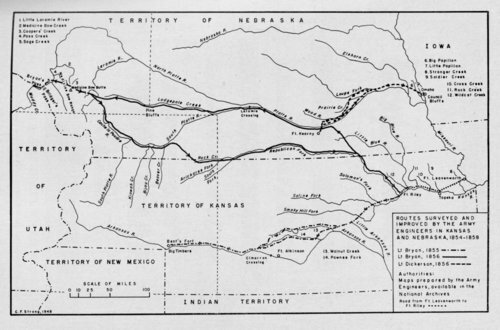 This is a map showing routes surveyed and improved by Army engineers in Kansas and Nebraska, 1854-1858. The routes from Fort Riley to the Arkansas River and Fort Riley to Bridger's Pass were surveyed by Lt. Francis T. Bryan. While Lt. Bryan was engaged in locating the route west of Fort Riley to the rockies in 1856, Lt. Dickerson concentrated his efforts on improving the eastern Nebraska military road from Omaha to New Fort Kearny. The map appears in "The Army Engineers as Road Surveyors and Builders in Kansas and Nebraska, 1854-1858" in Kansas Historical Quarterly, Volume XVII, 1949.